Art and the Animal. Tour produced by David J. Wagner, L.L.C. 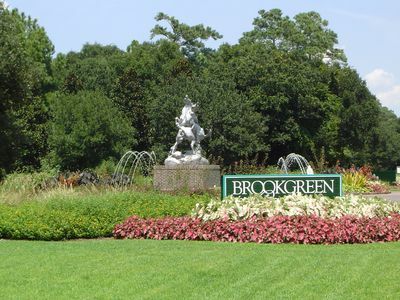 Brookgreen Gardens’ renowned sculpture collection encompasses an overview of important artworks and prominent American sculptors of wild and domestic animals from the mid-1800s to the present. Nearly half of the artists represented in the Brookgreen collection were or are considered animal sculptors. Following are a few of the artists and their works. 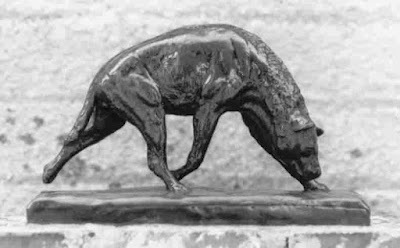 Edward Kemeys, born in Savannah, GA in 1843, was the first American sculptor to recognize the artistic possibilities of native animals as subjects. He studied in New York City and then, Paris, where he was impressed by the style of Antoine-Louis Barye. 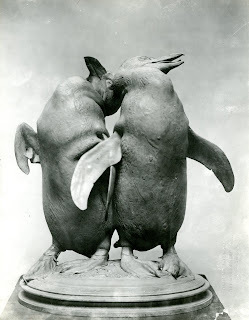 By the 1870s, Kemeys was producing sculpture of native animals that he observed on his many trips to the American West. His most famous work, Still Hunt, a tense mountain lion about to seize its prey, was created in 1881 and placed in Central Park two years later. His pair of Lions, flanking the entrance to the Art Institute of Chicago, was done in 1893. A Grizzly Grave Digger, in the Brookgreen collection, depicts a grizzly bear nudging the head of a bighorn sheep with its nose while scraping the earth around the head with its right front paw. The date of this work is not known, but the original model was part of a group of plasters presented in 1883 to the United States National Museum (now the Smithsonian American Art Museum). Although his work was not always technically nor anatomically perfect, Kemeys was the first American artist to devote his career to the depiction of native wild animals in sculpture. Following in his footsteps were men employed by America’s natural history museums. They served as taxidermists, exhibit designers, curators, and collectors for such places as the Smithsonian Institution in Washington, DC, American Museum of Natural History in New York City, and Field Museum of Natural History in Chicago. There were several prominent names among this group in the early Twentieth Century. Carl Akeley (1864-1926) was a taxidermist, sculptor, biologist, conservationist, inventor, and nature photographer, known for his contributions to museums, especially the American Museum of Natural History. In 1886, after apprenticing in a taxidermy studio, Akeley went to the Milwaukee Public Museum where he created the world's first complete museum habitat diorama in 1890. While working there and at the Field Museum of Natural History in Chicago, he developed his innovative techniques of taxidermy. His method of applying skin on a finely molded replica of the animal’s body gave results of unprecedented realism and elevated taxidermy from a craft to an art. Considered the father of modern taxidermy, he also displayed the specimens in groups in their natural settings. In 1909, Akeley began working at the American Museum of Natural History in New York City. He specialized in African mammals, particularly the gorilla and the elephant. He also invented “shotcrete” or “gunite” in the early 1900s, using it to fill plaster models of animals. In 1911, he was granted a patent for his invention of the "cement gun", the equipment used, and "gunite", the material that was produced. Later, this material was used in construction with one of the first applications being the construction of the Panama Canal. Akeley developed a motion picture camera for photographing wildlife, and also wrote several books, including stories for children and an autobiography titled In Brightest Africa. Akeley died in the Congo during his fifth expedition to Africa and was buried there, near where he encountered his first gorilla, memorialized in the sculpture, The Old Man of Mikeno. The Akeley Hall of African Mammals of the American Museum of Natural History is named for him. Brookgreen owns his first sculpture, The Wounded Comrade, a pair of female elephants flanking and supporting a wounded male with their bodies. James Lippitt Clark was a taxidermist, sculptor, and curator who worked with then succeeded Carl Akeley at the American Museum of Natural History in the early Twentieth Century and also worked with him in the production of a new camera manufactured for the US Government during World War I. Spotted Hyena was created in 1903 as a sketch model before creating a full-size form on which the animal’s skin was mounted for display in the museum. The hyena had previously resided at the New York Zoological Park. 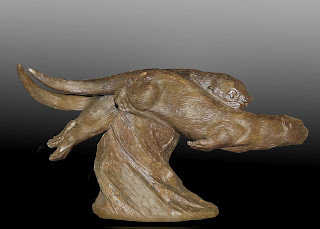 This sculpture shows Clark’s ability to impart a sense of motion, injecting his concept of the living creature into his knowledge of its anatomy. Robert Henry Rockwell came to sculpture through taxidermy, eventually working for several museums including the American Museum of Natural History. He was chief assistant to Carl Akeley during collecting expeditions for the Akeley African Hall, finishing the project after Akeley’s death. African Elephant was modeled by Robert Henry Rockwell in 1935 as a sketch for one of four life-size elephants in taxidermy for the Akeley African Hall of the American Museum of Natural History. He completed the sculpture, cast it, and exhibited it at the National Academy of Design in 1938. Survival of the Fittest was modeled in 1938 as a design for a life-sized group of moose in the museum’s North American Hall. His Black African Rhinoceros, which was also a design for a museum mount, dates from 1937. The next generation of taxidermists/animal sculptors in America was Louis Paul Jonas (1894-1971), Albert Laessle (1877-1954), and his student, Ralph Hamilton Humes (1902-1981). Each sculptor invested his work with experience in taxidermy, anatomy, and scientific observation. While Laessle often focused on the personalities of his animal subjects, Jonas established a career as a sculptor and a creator of displays and models for museums and expositions. Ralph Hamilton Humes initially came to sculpture as therapy after injuries to his hands and the loss of several fingers during World War I.
Louis Paul Jonas bridged the world of sculpture and natural history. He began studying sculpture at the age of 12 in Hungary. At 14, he joined his brother at his taxidermy studio in Denver. His observation of animal life was further developed by study in the field as well as at the Denver Zoo. At 19, he joined Carl Akeley at the American Museum of Natural History to assist with mounts of African Elephants for Akeley Hall. Eventually, he established his own studios for taxidermy and sculpture. Giant Sable Antelope was created by Jonas in 1928. Its sleek, Art-Deco design was used also as a logo for Jonas’s firm which produced fine art sculpture, dioramas, and animal figures for educational use in schools and museums. Displaying his talent for life-like creations, Albert Laessle’s comic sculpture, Penguins, was modeled in his Philadelphia studio in 1917. It received the Widener Gold Medal at the Pennsylvania Academy in 1918, and honorable mention at the Art Institute of Chicago in 1920. Dancing Goat was one of four sculptures by Albert Laessle acquired by Archer and Anna Huntington for the Brookgreen collection. Created in 1928, it has human-like attributes with its smiling face and high-kicking legs. Albert Laessle’s Duck and Turtle presents predator against prey, a common occurrence in the natural world. The unfortunate duck in the sculpture has been forced from its nest by a snapping turtle seizing its wing. 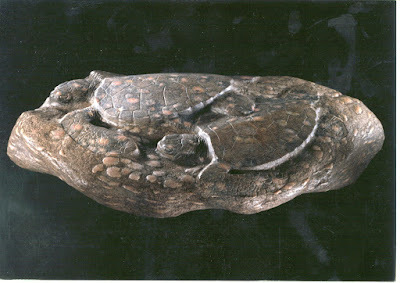 When he created Turning Turtle, it was so realistic that he was accused of having cast it from life. Ralph Hamilton Humes was injured in a bomb blast during World War I, causing him to lose an eye and parts of seven fingers. While convalescing at Walter Reed Hospital over a three-year period, he became interested in sculpture as a therapeutic treatment. Eventually, his art ability was noticed by doctors and the government paid for his initial art training. Wounded Crow was modeled after Humes found a crow with a broken wing. Its undaunted spirit inspired him to create this sculpture which won the Speyer Memorial Prize of the National Academy in 1932. 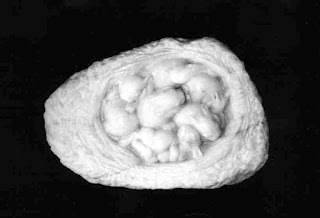 The Eagle’s Egg was modeled from earlier sketches and completed in 1953. It was cast in aluminum for Brookgreen at Anna Hyatt Huntington’s request. His Jumping Squirrel and Performing Goat are also in the Brookgreen collection. Alexander Phimister Proctor’s family moved to Denver, CO when he was six years old. Growing up on the frontier, Proctor early developed into a skilled woodsman and hunter—interests that remained with him for the rest of his life. In addition to a gun, he took pencils and a sketching pad with him on his trips through the Rocky Mountains. As a hunter, he was careful to measure, draw, and sometimes dissect the animals that had crossed his gun sights. He was fortunate to find an art instructor in Denver, where his early drawings included big horn sheep, elk, and bears. In 1885, Proctor sold property in Colorado and used the proceeds to move to New York City to study art at the National Academy of Design and, later, at the Art Students League. During this period, he assisted Augustus Saint-Gaudens with the General Logan Monument, now in Chicago. In 1896, he won the Rinehart Scholarship which allowed him to work and study in Paris until 1899. When he returned to New York, Proctor was well versed in the Beaux-Arts tradition. His ability to capture animals in action and his interest in Native American subjects provided a niche for Proctor that turned into a long, successful career. Trumpeting Elephant, created in 1908, was one of several animal sculptures he designed during the period. Born in Fort Worth, TX, in 1896, Joseph Boulton was interested in sculpture from an early age, digging clay from a river bed nearby his home and fashioning animals from it. In 1915, he went to New York City to study art and found work as an assistant to sculptor Hermon MacNeil. 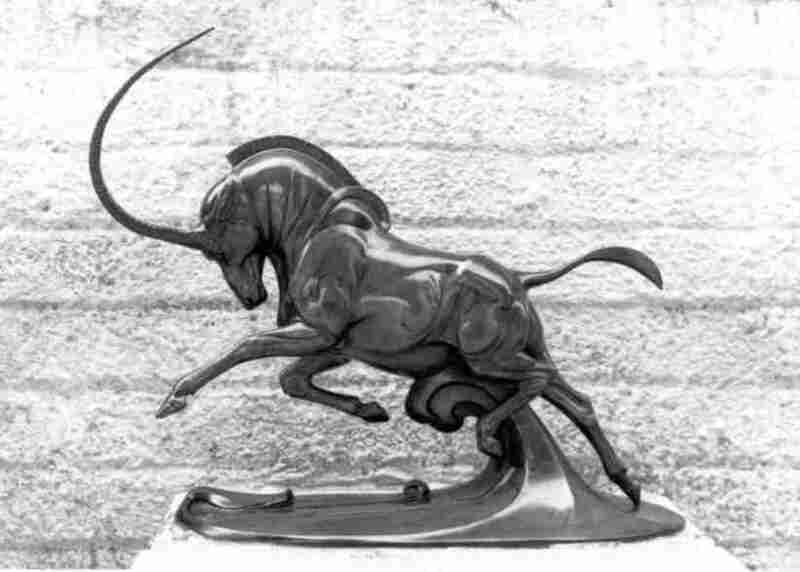 After serving in the Marine Corps during World War I, Boulton settled in rural Connecticut and returned to his career as a sculptor focusing on animals. Springtime Frolic won the Watrous Gold Medal of the National Academy in 1953 and the Gold Medal of Honor of the Hudson Valley Art Association. Rabbit Nest, carved in white marble, depicts six baby rabbits huddled together in a nest. Otters at Play, depicting a pair of swimming river otters, was done late in his life. paleontologist and marine biologist, and visits to her brother’s farm near Drayden, MD. Huntington was the first sculptor in America to use aluminum as a casting medium, preferring its ability to show well in poor indoor lighting and its light weight for shipping. Anna Hyatt Huntington had a long and prolific career as a sculptor. Her first sculpture was modeled in 1889 when she was 13 years old. She continued to work until a year before her death in 1973 at age 97. Brookgreen owns 104 sculptures by her. Eugenie Shonnard studied with James Earle Fraser and had criticisms from Bourdelle and Rodin. Although she also modeled human figures, her animal subjects were among her finest works. Marabou, carved in Napoleon gray marble, was designed as early as 1915 when she created a pair to use as gateposts. Studies of Co-co, a rabbit, were modeled and cast in Paris in the early 1920s. Gertrude Lathrop shared a studio with her mother, a painter, and her sister, a writer and illustrator. Working until the age of 90, she continued to receive awards well into her later years. Little Lamb, created and cast in silver-plated bronze in 1936, received the Speyer Prize of the National Academy and the Crowninshield Prize of the Stockbridge Art Exhibition in 1937. Also renowned for her work in low relief suitable for medallic art, Lathrop had been commissioned by Archer Huntington in 1945 to create a medal for the Brookgreen board of trustees. The obverse of her Wildlife Medal featured the extinct Carolina paroquet perched on a Southern magnolia pod and eating seeds. The reverse depicted a recumbent White-tailed deer framed by a Southern magnolia seed pod on the left and a blossom on the right. Also by her in the collection are Sammy Houston, a spirited young donkey, Fawn, a pair of dogs – Bozie and Saluki – and Great White Heron, an elegant, art deco-styled bird. Madeleine Park, a colleague of Anna Hyatt Huntington, specialized in modeling animals from life at the circus, rodeo and zoo, at kennels, or from her own menagerie at home. After her marriage in 1913, Madeleine Park lived in Katonah, NY. Studying with her neighbors, noted sculptors Phimister Proctor and Lawrence Tenney Stevens, Park naturally focused on animals as subjects. Not only did she model domestic animals, such as horses and dogs, but she observed and modeled wild animals at the winter quarters of Barnum and Bailey’s Circus at Bridgeport, CT. As she became known for her sculpture, Park was allowed to work inside the guard rails, a privilege given to only a few persons in the circus world. Such was her rapport with animals that they would often recognize her, even after long lapses of time. Ringling’s Walking Bull Giraffe (Boston), Ringling’s Running Dromedary (Bill), Sleeping Giraffe, and Modoc, an Indian elephant, were modeled during her circus visits. Although her animal sculpture encompassed a variety of subjects, Madeleine Park professed to like the elephant best, stating the elephant’s bulk lent itself to sculptural form. In 1948, Hunt Brothers Circus commissioned her to travel to India to collect animals and she brought back five elephants and a panther. Although Katharine Lane Weems’ father owned an important art collection and was chairman of the board of trustees of the Museum of Fine Arts at Boston in the early 20th Century, her wealthy family did not approve of her desire to become a sculptor. Thinking it an unseemly life for their daughter, they often denied permission for her to spend time in the company of artists. 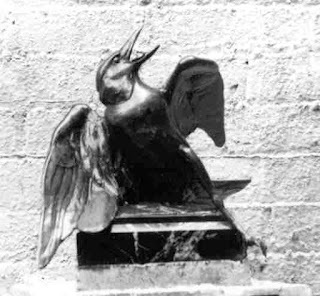 However, because the family of sculptor Anna Hyatt was well regarded in the Boston area, young “Kay” as she was called by her friends, was able to make unchaperoned visits to Anna’s studios in Cambridge and at Annisquam on Cape Ann from 1914 through 1919, and, in New York City in the 1920s where Anna Hyatt and Brenda Putnam shared a studio. There, Katharine Weems found the encouragement that she needed to continue her artistic study and received valuable criticism that helped her to grow into an award-winning sculptor of animals. She often depicted her own pets…Greyhound Lying Down was from Anna Hyatt Huntington’s personal collection. Weems’ Doe and Fawn, Whippet, Greyhounds Unleashed, and Circus Horse revealed her technical ability and flair for design. Elliot Offner attended Cooper Union in New York City, and received his BFA and MFA degrees from Yale University. He had 24 solo exhibitions and many public commissions such as the monumental group, Birds of Minnesota, in Minneapolis and Heron, Grouse, and Loon at Brookgreen Gardens, and several sculptures for the campus of Smith College where he taught for over 40 years. He also created numerous bas-reliefs of fish, bird, and animal fossils and skeletons many of which are in the Brookgreen collection. His work is in 22 museum collections and he was honored as International Master Wildlife Artist by the Leigh Yawkey Woodson Art Museum in 2003. He was a Life Fellow of Clare Hall at Cambridge University, and a Fellow and past president of the National Sculpture Society. Today’s sculptors of native and exotic wildlife have carried on the legacy of their predecessors, blazing individual paths toward recognition and public acquisitions of their works. A native of Sweden, Kent Ullberg is recognized as one of the world’s foremost wildlife sculptors. He studied at the Swedish Konstfack University College of Art in Stockholm and at museums in Germany, the Netherlands, and France. He lived for seven years in Botswana, Africa, and served as curator at the Botswana National Museum and Gallery. He has made his home permanently in the United States at Corpus Christi, TX and Loveland, CO. While he has completed hundreds of works on a small scale, he is best known for the monumental works he has executed for museums and municipalities from Sweden to South Africa. His installations in Fort Lauderdale, FL and Omaha, NE are the largest wildlife bronze compositions ever done, spanning several city blocks. Brookgreen owns his pair of otters, Ring of Bright Water, and his abstracted sculpture of a Preening Heron. Walter Matia was educated at Williams College in Massachusetts, where he earned degrees in Biology and Art Design. Upon graduation, he worked in the Exhibits Department of the Cleveland Museum of Natural History and, later, for The Nature Conservancy, a national non-profit organization. He started his art studio, Curlew Castings, in 1984. He sculpts both wild and domestic species of animals. A Fool for Love, a strutting male wild turkey, and a pair of American Foxhounds are located on the grounds and Timber Dancer, a woodcock, is on view in the Bleifeld Gallery. His African Gray Goose is on view in Brookgreen’s display in the Myrtle Beach Airport. Wyoming native Dan Ostermiller decided early on that sculpting animals would be his life’s work. Son of an internationally known taxidermist, he grew up surrounded by information about animals – anatomy, habitats and characteristics. From his artistic beginnings in Cheyenne, Ostermiller enlarged his knowledge of wildlife with expeditions to Alaska, Africa and Antarctica, and all corners of the American West. Paralleling this activity, he immersed himself in art history by studying works in world museums and reading voraciously. His approach to form, composition and surface texture has given him professional recognition through prestigious awards and public exhibitions. To date, he has placed over forty monumental pieces in public and private locations in sixteen states. His Scratching Doe, Dromedary, and pair of Peacocks gateposts are in the Brookgreen collection. Steve Kestrel’s work has much in common with ancient works and is distinctly intellectual in its presentation and form, blending geology, paleontology, and mysticism in a manner that is uniquely his own. In a recent interview he said: “I try not to let my work be overly realistic, I’m not interested in making ‘little models.’ I believe that there is more strength and are more connections to the conscious and subconscious in using symbolic, archetypal or visceral images.” Rooted in the American Southwest, his life has been shaped by the land. When asked, Kestrel will nod to the inspiration of ancient cultures, allowing that an early interest in art, anthropology, and paleontology fostered his growth as a sculptor. But at the heart of his sculpture is a deep appreciation for and understanding of the material and the process – something that is intrinsically revealed in the work of a direct carver. The abundance of wildlife in its natural environment provides a fertile source of subject matter for Kestrel’s artwork. 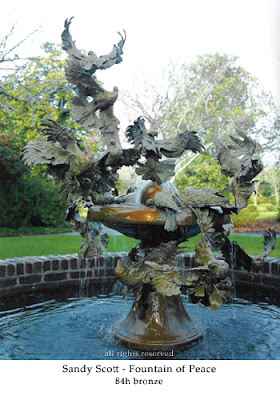 Brookgreen owns Warm Currents, a group of sea turtles carved in river stone, and La Luna, a luna moth on a datura blossom, cast in bronze from the original stone-carving. Sandy Scott trained at the Kansas City Art Institute and worked as an animation background artist for the motion picture industry before turning her attention to etching and printmaking in the 1970s and sculpting in the 1980s. She has received awards for sculpture and etching from the National Academy of Design, Allied Artists of America, Pen & Brush, American Artists Professional League, Catharine Lorillard Wolfe Art Club, and National Academy of Western Art. Her work is the subject of a book, Spirit of the Wild Things – The Art of Sandy Scott, and was featured in the book, The American Sporting Print – 20th Century Etchers and Drypointists by John T. Ordeman. Brookgreen owns her bronze sculptures Peace Fountain, Eat More Beef, Presidential Eagle, Mallard Duet, and Ancient Passage. Jan Rosetta, who sculpts under the name, Rosetta, has received many commissions and public placement of her work including the Lincoln Park Zoo, Brookgreen Gardens, Leigh Yawkey Woodson Art Museum, Florida Institute of Technology, and the Cities of Loveland, Lakewood, and Steamboat Springs, CO, and Dowagiac, MI. 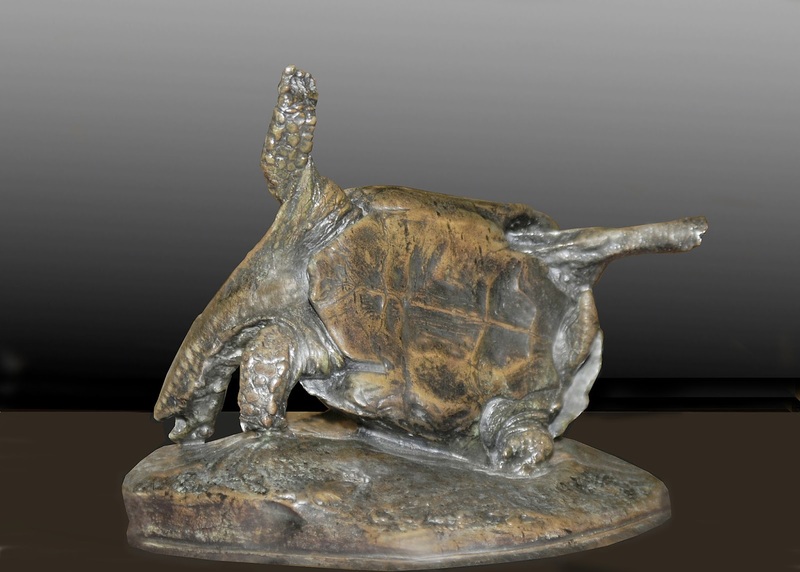 A Fellow of the National Sculpture Society and member of the Society of Animal Artists and Northwest Rendezvous Group, Rosetta has won awards from these organizations as well as from the Allied Artists of America, Bennington Center for the Arts, Pen & Brush, Bosque Conservatory Art Council, and Steamboat Springs Art Council. Her life-size mountain lion, Mountain Fishing, is in Brookgreen’s display at the Myrtle Beach Airport, and Roaring Lion is in the Offner Center. Maryland native Bart Walter graduated from the Friends School in Baltimore and Hiram College in Ohio. Since 1992, beginning with the design for the Jane Goodall Award for International Conservation, Walter has focused on subjects of animals, wild and domestic, on the African and North American continents. He has had 12 solo exhibitions since 1993, and has participated in numerous juried group exhibitions. Walter’s work has been awarded the Silver Medal of the National Sculpture Society and the Members and Associates Award of the Allied Artists of America. In 2000, he was selected Master Artist by the Easton Waterfowl Festival and, in 2006, he received the Distinguished Alumni Award of the Friends School of Baltimore. Otter Rock (Entwined) and Rhythm, a pair of ibis, are in the Brookgreen collection. After working with Gilbert Maggioni of Beaufort, SC, for two years in the early 1970s, Grainger McKoy set out to become a sculptor. As he says: “Gilbert inoculated me against mediocrity while at the same time encouraging innovation and preaching there is no substitute for hard work. I continued to push wood and my subject matter to their limit. I believe that over the years I have been able to make wood fly, yet all along I knew there was more to be discovered and tested.” Bridging the gap between wood and metal sculpture, McKoy began with woodcarving, then gradually began to produce sculpture in bronze, stainless steel, and silver from molds made of the original wood. Brookgreen owns 12 wood sculptures by Grainger McKoy including his landmark works: Covey Rise, Sanderlings, Least Bittern, Flying Brown Pelicans, and Common Tern. A native of Virginia’s Eastern Shore, William Henry Turner grew up amid the abundant wildlife of the Chesapeake Bay, exemplified by his sculpture, Great Blue Heron. In 1942, he met Robert Henry Rockwell, who had retired to the Eastern Shore from his career at the American Museum of Natural History. Helping in Rockwell’s studio and studying informally with him, Turner was inspired to become a sculptor. After launching a successful dental practice to pay the bills and creating art in his spare time, Bill Turner eventually gave up dentistry to focus on sculpture and established his own foundry and gallery. Sometimes collaborating with his son, David, the Turners have created works for the Chicago Botanic Garden, The Nature Conservancy, National Audubon Society, New York Zoological Society, and the American Museum of Natural History. Bill Turner’s Timber Wolf Family at the latter institution was created to honor his mentor, Rockwell. David Turner’s Alligator is located at the alligator exhibit in Brookgreen’s Lowcountry Zoo. These are but a few of the animal sculptors in the collection who have made Brookgreen Gardens an important destination for those who enjoy this branch of sculpture. Archer and Anna Hyatt Huntington’s dream in 1931 to establish a wildlife sanctuary for native plants and animals while collecting and exhibiting American figurative sculpture has become a National Historic Landmark and a wonderful place to see great art within the natural environment. The collection continues to grow. Earlier this year, the Stanley and Naomi Bleifeld Gallery, dedicated to exhibiting sculpture depicting forms found in nature, was officially opened to the public. Nearly all of Brookgreen’s collection is on view at all times – from monumental outdoor fountain sculptures to plaster and wax models and small sculptures in indoor galleries – along with traveling exhibitions and other borrowed works. Brookgreen Gardens is open everyday, except for Christmas Day, throughout the year.